Tennessee – Where is Ruthi? On December 26, 1862, General William Rosecrans (Union) marched his Army of the Cumberland thirty miles from Nashville, Tennessee towards Murfreesboro, Tennessee. Today this is an easy drive from Nashville to Stones River National Battlefield. I begin my day at the Visitor Center where I view the exhibits and thirty-minute film explaining the circumstances and importance of the battle. At the end of 1862, President Abraham Lincoln desperately needed a Union victory to boost morale and ensure enforcement of the Emancipation Proclamation taking effect January 1, 1863. From December 31, 1862 through January 2, 1863 the Confederate and Union armies, 81,000 men, waged a fierce and deadly battle at Stones River. After each side lost nearly one-third of its men, General Braxton Bragg and his Confederate Army of Tennessee withdrew from Murfreesboro. The six stops on the self-guided auto touring route include some with short walking trails. I change from sandals to hiking shoes, spray down my body and clothing with bug repellent, and immerse my imagination into the images of a bloody, heart-breaking war where brother fought brother and friend fought friend. I visit Hell’s Half Acre where Union Colonel William Hazen lost 400 men on December 31, 1862. Survivors of the battle built the Hazen Brigade Monument in 1863 making it one of the oldest Civil War memorials. I visit the markers indicating the sites of General Rosecrans’ and General Bragg’s Headquarters. 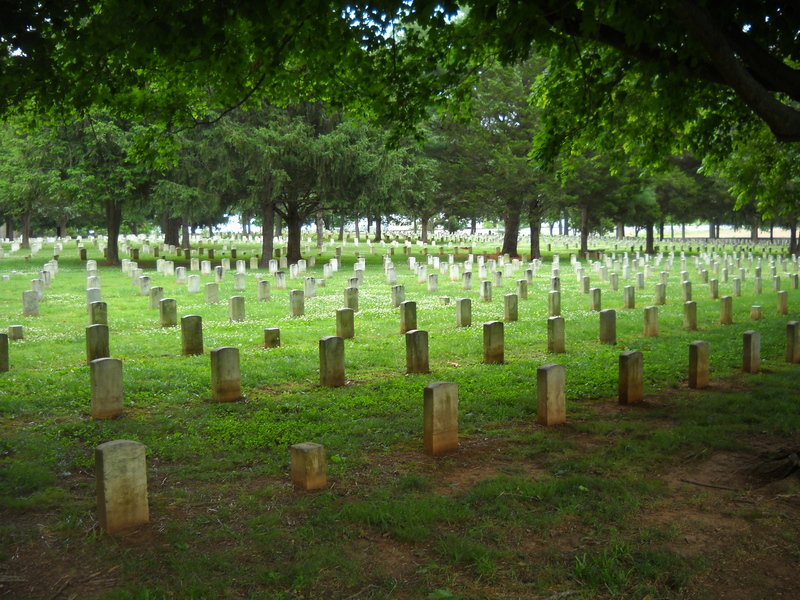 I visit Stones River National Cemetery where over 6,100 Union soldiers are buried. 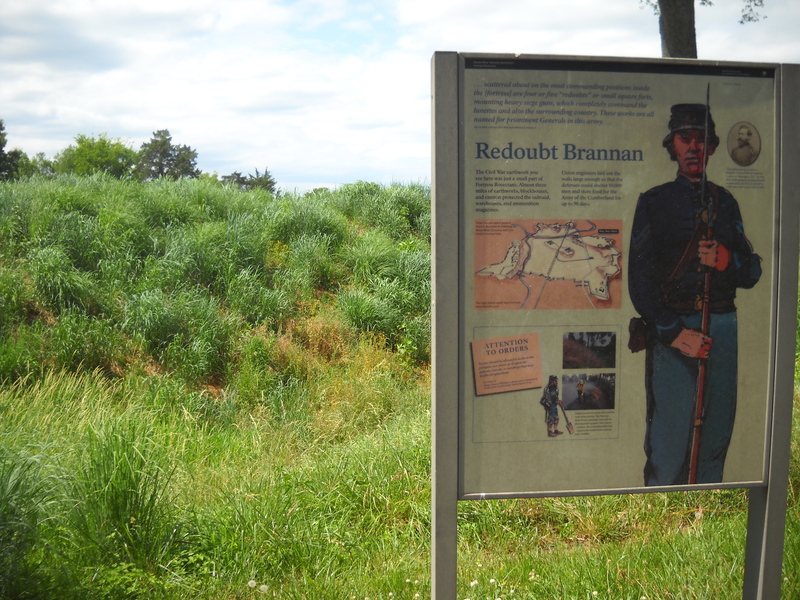 After the Union victory at Stones River, Rosecrans’s army and hundreds of former slaves built a fort at Murfreesboro. I make the short drive to Fortress Rosecrans. The original 200-acre Fortress Rosecrans was huge and built almost entirely of earthworks. Three miles of earthworks! That’s a lot of digging! The fort could shelter 15,000 troops and store supplies for 65,000 men. In fact, Fortress Rosecrans enclosed four small forts as well as powder magazines and storehouses. Even after studying the excellent map exhibit at the visitor center; I am overwhelmed at the immensity of the relatively small portion of earthworks still standing. Redoubt Brannon, one of the four small forts, has been preserved with walking trails and wooden overlooks. I explore as much as I can before my bug repellent wears off and I need to return to my car and continue down the road. I have a condition. Or a syndrome. Or maybe a disease. My husband says it is a mental disorder. I have Directional Dysfunction. I can’t tell north from south, up from down. I get lost at shopping malls, parking lots, even the grocery store. I got lost once at a rest stop on I-10 when I came out of the restroom and turned right. I should have turned left. Fortunately, my husband was born with two eyes, two ears, a mouth, and a compass for a nose. He ALWAYS knows where he is, how he got there, and how to get to where he is going. You know the type. After he has been to a new place only once, Stephen can return to the same place without the use of a map or a GPS. His nose always knows. My nose doesn’t know snot! Normally, I can compensate for my directional ineptitude by relying on tricks such as always parking my car in the same spot at the back of the parking lot, making mental notes of unusual landmarks, leaving a trail of bread crumbs, and allowing extra time because I WILL miss my exit the first time (and probably the second). I have a GPS in my car and on my phone. I have a husband I can call at any time to ask him where I am and how do I get to where I’m going. I have a very large Atlas (National Geographic’s National Park version of course!) slipped nicely between my car seat and the console. And I pick up two copies of the national park map at each park I visit in case one rips or I lose one. But there is nothing in my arsenal of directional artillery that has prepared me for Chattanooga, Tennessee. First of all, is Chickamauga and Chattanooga National Military Park in the state of Georgia or is it in the state Tennessee? I decide that it is in the state of Confusion. Or at least that is my state! Right off, my best friend (or worst enemy depending on how you look at it), SIRI (of the navigation system SIRIs) is unhappy because Georgia is in Zone 8 and Tennessee is in Zone 6. I google the park and discover there are two visitor centers. One in Georgia and one in Tennessee. I choose Chickamauga Battlefield Visitor Center in Georgia and inform SIRI by describing my destination in “Point of Interest”. She instructs me that “there will be roads with incomplete data, turn by turn guidance will not be provided”. After only one wrong turn, I arrive at the visitor center ten minutes before it opens, giving me time to study the map on the outside wall. 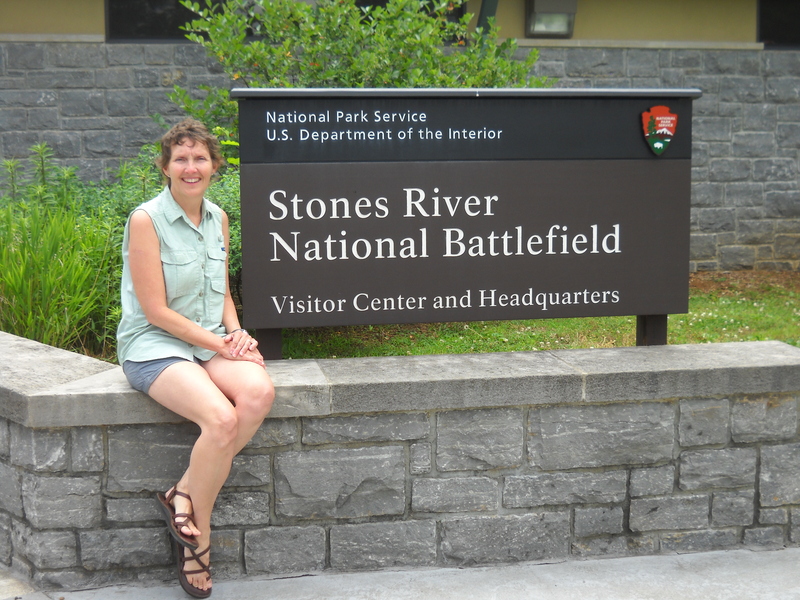 The ranger unlocks the door and I go straight for the National Park Service maps. Hidden behind an innocent facade of a bloody battle scene, are THREE different maps, each with red, green, black, and yellow lines. It’s time to ask for help. And not from SIRI. The park ranger informs me that Chattanooga was the site of not one Civil War battle, but two Civil War battles: The Battle of Chickamauga and the Battle of Chattanooga at Lookout Mountain. And, in addition to the battlefields, there are Civil War sites all over the city. 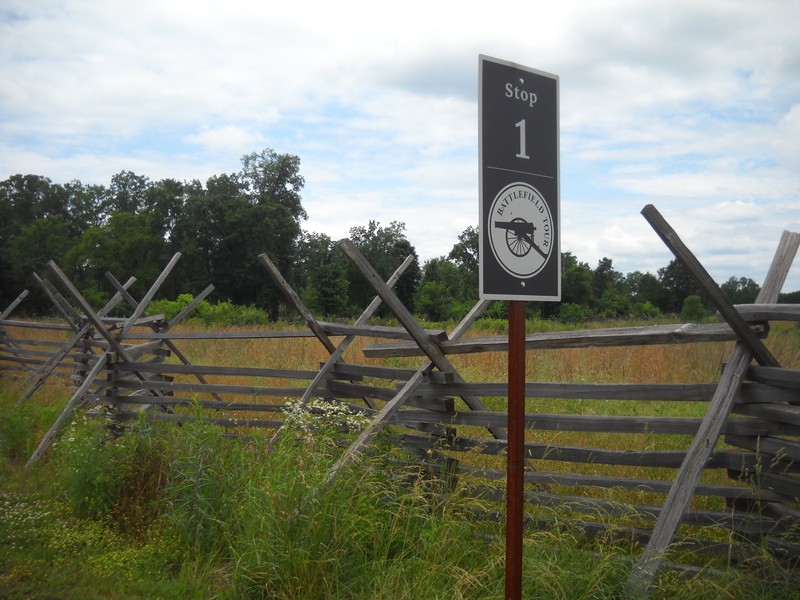 After watching the 23-minute film describing the Battle of Chickamauga, after obtaining the seven cancellation stamps for my National Park Passport, and after viewing the 346 military gun collection, I set off for the seven-mile auto tour of the battlefield. You would think that with a map, and with directional arrows provided at every turn, today’s tour of the battlefield will be a simple task. NOT! Although the self-guided driving loop is very well marked with eight major parking areas and several smaller turnouts along the way, I manage to take two wrong turns. I quickly notice the error and return to the correct path. I am very good at turning my Camry around on small dirt roads. I have done it many times. 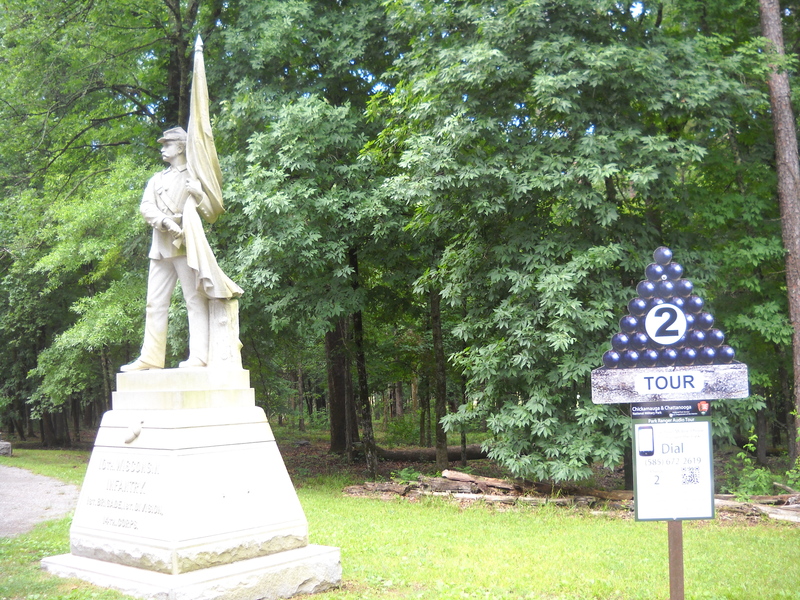 The driving tour really is well marked with placards, monuments, and exhibits that explain the events that occurred here during the Civil War. 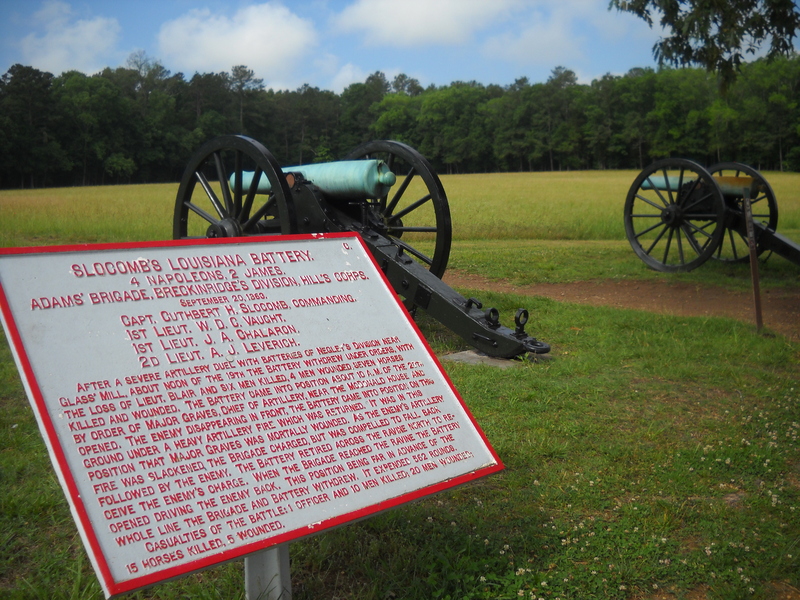 Chickamauga was one of the bloodiest battles of the war. Over 120,000 soldiers clashed during the fall and winter of 1863 and over 35,000 were killed including generals and other leaders. 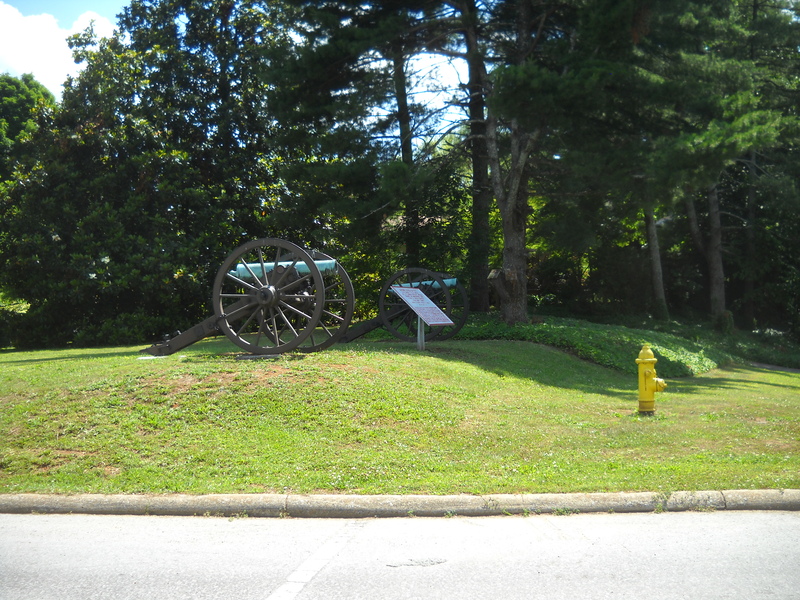 Stop Number 6 is a monument to the Wilder Brigade where, on September 20 Confederate troops broke through the Union line which led to a Confederate victory at Chickamauga. The monument stands on the site of a house which served Union General William Rosecrans’ headquarters. 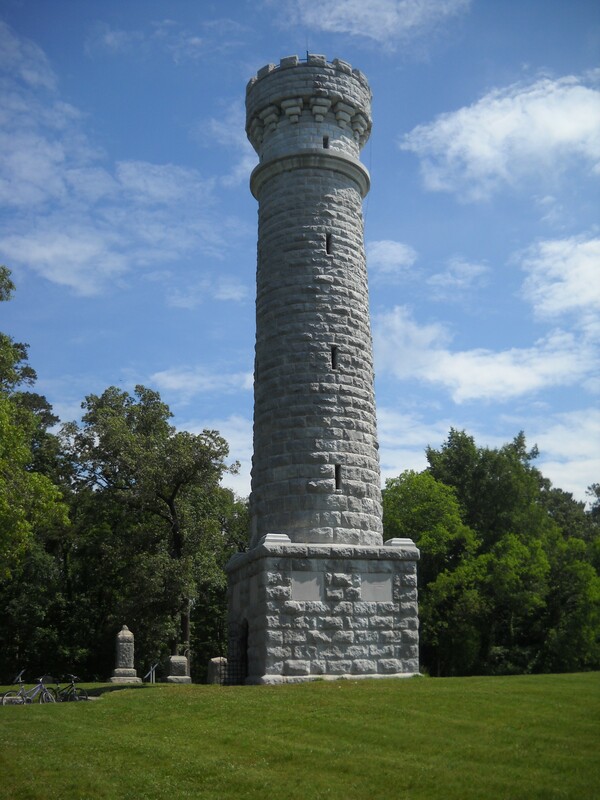 The 85-foot tower can be climbed (136 stairs) for an amazing view of the battlefield. Lookout Mountain Battlefield has its own visitor center. The park map indicates a recommended route to get there. It looks complicated so I ask SIRI for advise. She suggests a totally different route. After a brief discussion, we agree to disagree and I choose the park’s recommended route. I end up in a neighborhood I am not certain is even located in Chattanooga. I’m not sure if I’m in Tennessee or Georgia. In fact, I have no idea where I am. I apologize to SIRI and she directs me to a very touristy, congested area of Chattanooga. Here I discover why Lookout Mountain Battlefield is named Lookout Mountain Battlefield and why its visitor center is named Point Park. Lookout Mountain Battlefield is located ON a mountain and Point Park Visitor Center is at the very top. The road to the top is straight up the mountain. I take a breath and go for it! Scenic Highway switches to East Brow Road at the one switchback. The narrow two-lane road with no shoulders passes houses and, what!, an Incline Railway. The need of an Incline Railway should be a clue to the steepness of this mountain. I pass the parking lot for the Incline Railway and slowly continue up the mountain. Soon I encounter a man with a very long beard wildly waving his arms next to a large, man-made waterfall fountain. I slow even more and realize he is encouraging me to park in a lot where I can, for a fee, view the wonders of Ruby Falls. It looks fun, but very touristy commercial and I am on a quest to experience National Park sites so I wave back and continue up the mountain. And up the mountain. And up the mountain. After a bit, I see it! An entrance gate built by the U.S. Army Corps of Engineers in 1905. It is a large entrance and I learn that it is the world’s largest replica of the Corps insignia. So large that even I can’t miss it. But what I do miss is the tiny sign indicating the free parking lot for the Point Park Visitor Center. I park at a meter and diligently put eight quarters in the slot. Two hours should allow plenty of time for a leisurely visit. There is a $3 fee to pass through the gate to Point Park; however, my Annual National Park Pass got me in for free. Immediately upon entering the park, I am struck by the amazing views! 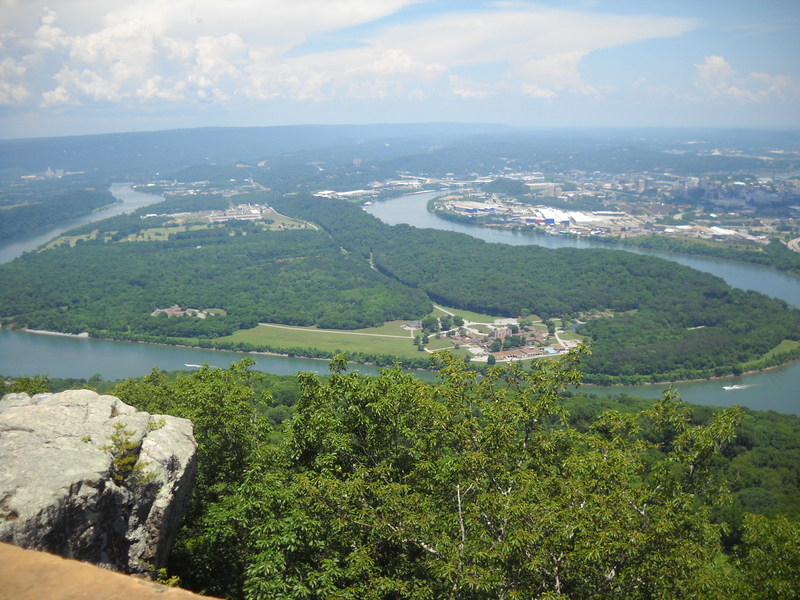 During the Civil War, the Confederates held Lookout Mountain until they realized the advantage of being high on a mountain did no good because their artillery could not reach Chattanooga. But, they did have an absolutely clear view of Moccasin Bend and the Tennessee River as it takes a U-shape turn. I wander the grounds and explore the small museum before heading back to my car and the trip down the mountain. I stop about half-way for a ranger-guided tour of Craven’s House. 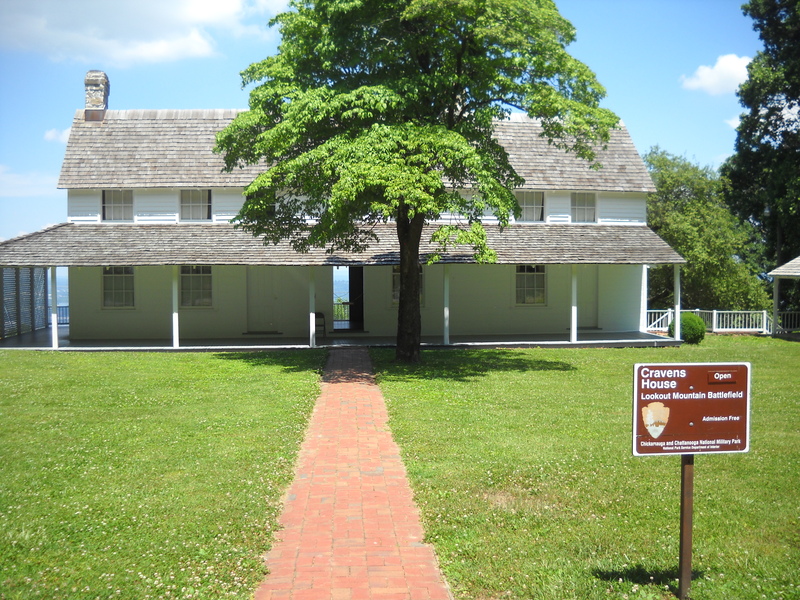 The Craven family lived here before and after the Civil War. Mr. Craven was a prosperous businessman from Chattanooga. The confederates stationed nearby would warn the family if they saw smoke from Chattanooga. The family would run to the cellar for cover until all was clear. During the Battle of Chattanooga the family took refuge in Georgia which was a smart thing to do because on November 23, 1863, the Union took over Lookout Mountain in what came to be known as the “Battle Above the Clouds”. When they returned, Mr. Craven discovered his house utterly destroyed; not from gunfire or fire fire, but from the soldiers taking it apart board by board for their campfires. He rebuilt the house exactly as it looked pre-war. Either he did not have much imagination or he really, really liked his house. I don’t blame him. I like it too.